From hopscotch to art gallery heists, the SOMArts Cultural Center has been transformed into a place for unique play experiences. 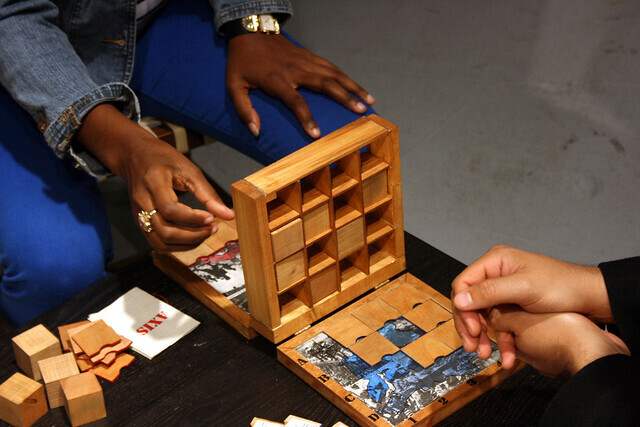 With games inspired by everything from parkour to women of the Wild West, Come Out & Play SF Festival and Exhibition encourages a variety of interactive play for people of all interests, ages and abilities. The festival started in New York in 2006 and debuted in San Francisco last year. A huge turnout is expected this year, with many people pre-registering for games on Eventbrite. Word-of-mouth has been key in generating interest. Along with putting the event together, Herdlick contributed a game called WANTED!, an interactive street fiction played by up to 10 players with SMS-enabled cell phones. Players take on the role of a cowgirl, which Herdlick established in contrast to popular games that are dominated by male characters. Not a fan of Westerns? Try the Hearst Collection, an art heist game that challenges players to steal donated pieces of the Hearst family’s art collection without tripping the alarm. For a physical challenge minus the art theft, try Sloth Chase, created by game designers and traceurs Eric Rubin and Albert Kong. A parkour-inspired lava tag, Sloth Chase challenges its participants physically and creatively to navigate obstacles in the city. The opening night of the exhibition was just the tip of the iceberg. Nearly 30 different games will be played during the festival, which runs through Dec. 19. Exhibit attendee Catalina Nan, who heard about Come Out & Play from a friend, said she hopes to participate in more of the festival’s games. The Come Out & Play exhibition at SOMArts is open Tuesday through Friday from noon to 7 p.m., and Saturdays from noon to 5 p.m. SOMArts is hosting a festival weekend on Dec. 1 and 2 from noon to 5 p.m. Admission is free for all events.